318 Lukie Points will be rewarded to you when you buy this. It seems that the Belmont family can't seem to permanently get rid of the world's vampires. Now, it's up to two descendants of the famous vampire-hunting clan to challenge the blood-sucking vampires to a showdown. In the year 1917, a vampiress named Countess Bartley is on her way to resurrect her uncle Count Dracula. It's up to you, as either the whip wielding master, John Morris or the lanceman, Eric Lecarde, to pursue the Countess and bring her down before Dracula is awakened. Alas, her trail of doom is laden with zombies, hideous mutants, grotesque giants, ghouls and ghastly creatures. Taste the sweat dripping into your mouth as you try rescuing yourself from diabolical traps. My cousin got this for me back in the day as a Christmas present and I didnt realize how much it would be worth today. the game is great but having to pay $300+ to get it back isnt. you never know what you had until you lost it. Like Castlenvania? Own a genesis? Here's your man. In Castlevania Bloodlines, you are given the choice between playing as John Morris, or Eric Lecarde. John uses a whip while Eric uses the "Alacarde Spear." The differences between the characters are minor, but each has one difference in their available attacks, with Eric being able to perform a "ground slam" type attack(which I haven't found very useful), and John being able to attack in the upper diagonal directions. 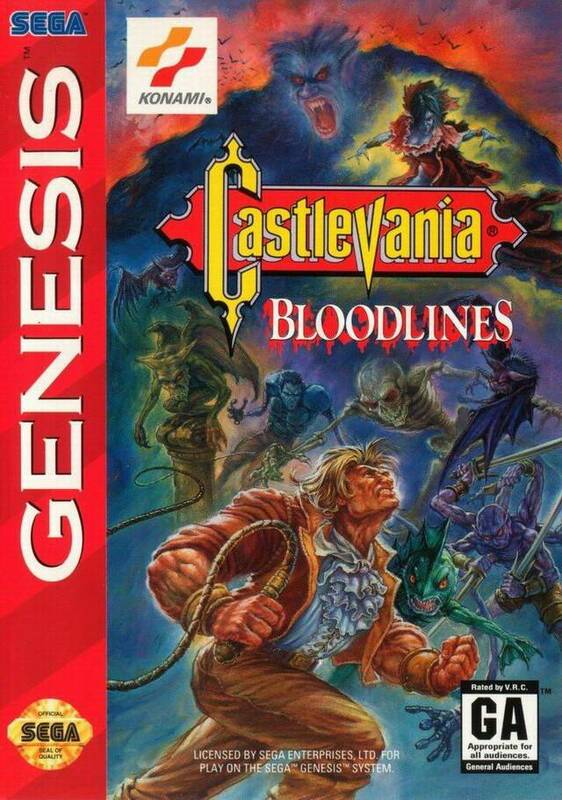 The basic formula for the game is the same as the original castlevania. It has the same linear style gameplay which made the original so challenging and satisfying. Graphically the game is pretty impressive, with what I think is wonderful animation on the player's character. What makes it more impressive is the fact that the game takes you all over the world, including levels drowned in greenery and or in water. 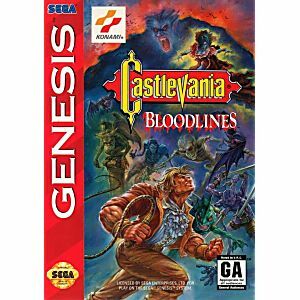 Although not quite on the same level as Super Castlvania, Castlvania Bloodlines is definitely worth picking up if you own a genesis and are looking for a challenging platformer.